Unique visitors: Each visitor is a unique person, counted once. Pageviews: The total number of pages viewed during all visits. Returning visitors: All visitors returning to your site after initial 24 hr. period. Note: Returning visitors are counted once in Unique Visitors total. s.e. = single event: visitor clicked on a single page of your site, no second click or exit event recorded. Duration of visit is undefined. Visits: Every visitor can visit an unlimited number of times. Visit time (avg): Average duration of all visits; the sum of all visit times divided by the total number of visits, not including single event (s.e.) visits. Referring links: Number of visits initiated by a referral from a 3rd party site. Examples are: search engines, forums, banners, links, directories, portals, shops, index pages, etc. 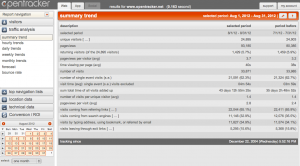 Search engines: Number of visitors coming through search engines. ‘Recognised search engine list’ is located on our forum. Note: Search engine visits are included in the “Referring links” total. Exit links: An exit link is a link from your site to another domain. A report charting essential traffic summary variables over time and comparing the numbers to the identical previous period (ie this month and last month). The report gives variables for two separate periods of time: the period selected and the period before. Calendar Set the date range using the calendar. Options bar The options bar lets you print, download, and PDF the displayed report.